Granted, it’s really hard to call anything not made with any glutinous ingredients a noodle. Wheat, rice, even mung beans are used for noodles found in everything from Italian cuisine to my favorite of all Asian soups – Pho. So, sure I had a hard time calling my latest excursion into molecular cooking at home “noodle making.” Yet, there they are at the top of this post in all their glory – “noodles” made of nothing but the juice of fresh cucumbers and agar-agar. And I’d have never even thought of tackling this had it not been for the Spaghetto Kit, given to me as a gift from Peter and Jo (who else?). As I said, the ingredients for making noodles in this manner are straightforward: 250 ml of juice (any juice or broth will work) and 4 grams of agar-agar. This is brought to a boil, chilled, then injected into tightly wound coils of plastic tubing using a squeeze bottle filled with the juice/agar-agar mixture. Once the plastic tubes have been filled with the juice mixture, you drop them into a bowl of ice water for a few minutes, then push the noodles out of the tubing using a CO2 charged whipper, pump, or whatever you happen to have that has the pressure required to release the noodle. I will admit to you right now that everything I’ve attempted leading up to this has been a literal cake walk. This, my friends, was tougher than fruit caviar, reverse spherification, ravioli, or the coconut-mango egg. Had a video camera been rolling on me during this experiment, you’d have heard curse words not known to man. Sometimes my rationale for not doing something the right way parallels the decisions that kept me out of the good schools when I was younger. I say this because I think it’s time for me to break down and buy a juicer. Seriously, this was ridiculous. Juicing anything without one is time consuming, and a lot of work. Ready to hear how I did this? I peeled, sliced, and seeded 4 fresh cucumbers purchased from our local farm in Cypress. This went into a food processor until they were nearly liquified. I then strained the cucumber puree through a big piece of cheesecloth and squeezed out enough juice to give me 350 ml. That’s some hand made juice, my friends. To this, I added 1 teaspoon of salt. You may note that I only needed 250 ml of fluid, as noted above. The reason I collected 350 ml of juice was because I fully intended to reduce this down to 250 ml to concentrate the flavors a bit. Cucumbers, as you may know, are 95% water and (for the most part) flavorless. Into the cucumber reduction went 4 grams of agar-agar, which is a form of gelatin derived from seaweed. This is another reminder to those who think molecular cooking items are “inedible”. Agar-agar is one more ingredient made from something found in the sea. Please feel free to let me know when things found in the sea have suddenly become inedible after thousands of years. I’ll be here. The cucumber/agar-agar solution was then brought back to a boil, chilled to room temperature, then poured into the squeeze bottle and squirted into the plastic tubes. These were then dropped into a bowl of ice water, and left to chill until completely set. I did this for 4 minutes, then 5 minutes, and finally 7 minutes. Trial and error, kids. I had some righteously squishy noodles burping out of those tubes at 4 and 5 minutes. Once held at the 7 minute mark, the agar-agar really set, resulting in a firm noodle that held on the fork very well. It had the consistency of a well cooked pasta noodle, yet fell apart in your mouth. Exactly the texture I was shooting for; it just took some time to get there. And to push the noodles free, I used none other than the syringe I used for the caviar. It worked perfectly. I’m not sure why I was expecting a more intense flavor from the noodle. It was, after all, cucumber. My reduction of the juice had to help a little, along with the salt. It was cold, refreshing, and tasted of cucumber. The instructions said to make sure the juice had an intense flavor, as the agar-agar and process of squeezing the mixture into the molds tends to mute it. I wish I’d tasted the cucumber juice prior to reducing and mixing, just out of curiosity. Next time, I’ll aim for a more intense flavor profile. Beets, perhaps? I thought of chicken noodle soup, sans the soup. It would be an intense chicken stock reduced down to demi-glace territory, then mixed with agar-agar. The possibilities are endless, really. I’ll try this again soon. I understand. I really do. Fried food is bad for me. But I’ll be damned if I’m going to let a little fat get in my way of enjoying a good fish fry every now and then. In this episode, we’re experimenting with Trisol, a wheat starch-based additive from Albert & Ferran Adria’s “Surprises” collection. Jo gave me nearly a pound of this stuff to experiment with, and the results were amazing. When mixed with all purpose flour, Trisol becomes the perfect coating for deep frying. The magic of Trisol is its ability to not retain a lot of the oil you fry your food in. The result is not only incredibly crispy fried food, but non-oily as well. It’s safe to say that, while frying food is inherently unhealthy, this is the healthiest way to go about doing it. I thought it would only be fitting that the beer I’d pair with this also has Ferran Adria’s stamp on it. Inedit is a Witbier made by Damm, a Spanish brewery. It’s the first beer specifically created to accompany food. It was created by Damm brewmasters and by Ferran Adrià, Juli Soler and El Bulli’s sommeliers’ team. Listen to Episode 38 now. • Does race matter with sushi chefs? Music in this episode from Filter. Download the song from the iTunes store. I wish I could say this was my idea, but it wasn’t. Truth is, it was 100% Peter. Peter, as in Stougaard. You may recall the story I told in Episode 33 when, while in our Molecular Cooking class making apple caviar, Peter suggests making the caviar with wine. So we did, and it was fantastic. Then, some time later, I find out that Sean Paxton “The Homebrew Chef” made a similar caviar, but with a very nice Belgian beer. So fast-forward to the dinner party at Ray & Afaf’s house last month when I told Peter that I’d bought a lot of candy molds to start making edible shells with. 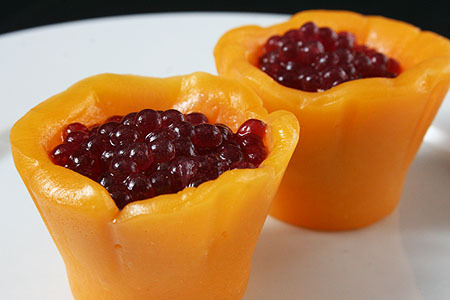 I thought these could be made with chocolate and filled with fruit caviar or a host of other things. The shells were made with 100% English Sharp Cheddar. I bought a small brick of it at Trader Joes, shredded it, and placed into a small sauce pan. I melted it over low heat until it looked like thick fondue. I then poured the melted cheese into the cup molds and pushed the cheese into the molds with my fingers until it completely filled them. This went into the freezer to set. After 20 minutes, out they came, and a firm squeeze of the molds released the cups. I left them at room temperature. For the wine, I wanted something with a bit of a full body, and a lot of deep, overly ripened fruit flavors. I like drinking Hess Cabernet for this reason. Easy drinking, very graceful. Let me just say up front that this is really a horrible thing to do to wine. Sure, you want it to aerate a bit, get some oxygen. But when you stick a hand blender in wine, it’s literally oxidizing before your eyes. But it’s all about effect, right? The key is to allow the wine/alginate mixture to settle down before you start making the caviar. This allows some of that air you’ve injected into the wine to escape. The less air you have in your caviar blend, the more intense the flavor will be. Wine and cheese do go together, especially in your mouth at the same time. The caviar tasted like tart, unripe grapes, but the sweetness of the cheese really helped it out. Just pop a cheese cup filled with wine balls into your mouth and chew. It was rich and creamy, with what seemed like an infinite number of flavors happening at once. Before Americans started working their magic with the hot dog, the hamburger, and (gasp) macaroni and cheese, Syrians have been developing some of the most innovative food on earth. Heavily dependent on fresh ingredients (especially vegetables), Syrians are very particular about what goes into their food. One ingredient that goes into their food that is undeniable however, is love. Recently we were invited to dinner at the home of our new friends Ray & Afaf. To call it dinner was an understatement. I was overwhelmed with not only the quantity of dishes Afaf had prepared, but the quality as well. Perfectly grilled kebabs, dips, fresh and cooked salads, meat, meat, and more meat — it was food overdrive. In this week’s episode, I share my culinary experience with you. I’m sure I didn’t nearly do it justice, and I more than likely disfigured the pronunciation of each dish (please forgive me). But I can tell you it was a meal I will not soon forget. • McDonald’s finally did it. They made Japan fat. • Duck bacon? There’s only one bacon, and it comes from a pig. Listen to Episode 37 here. Music in this episode from Fila Brazillia. If you like it, buy the song from Amazon.com. 89 cents and worth every single penny.